“The whole ethos behind the Deepdale Outdoor & Wildlife Festival is to enjoy the local environment while caring for it. The beauty of the North Norfolk Coast is the reason our visitors come to stay and the key to all economic development in this rural part of Norfolk - beautiful countryside, fresh sea air, big blue skies, salt marshes, woods and fields - nature at her best. Let’s keep it that way!” said Jason Borthwick, organiser of the event. The marquee and outdoor stands will host a diverse range of organisations who want to help you enjoy the outdoors and wildlife of the North Norfolk Coast. Hunstanton Sea Life Sanctuary, Eastern Inshore Fisheries, the RSPB, National Trust, Hawk & Owl Trust, Pensthorpe and the Woodland Trust will be able to answer your questions on the local wildlife and habitats. Extreme Animal Encounters will let you meet many of the local and invasive species. Natural Gardens can help you grow your very own wildlife habitat. You can explore this beautiful part of the world – TheCanoeMan runs sea kayaking trips to experience the salt marshes and harbour from a different angle. One Stop Nature Shop can supply you with all your wildlife watching equipment including binoculars and bird feeding accessories. If cycling is more your thing then Deepdale Bike Hire and Sustrans can help. Maybe your daughter or granddaughter wants to add some adventure to their life with Girlguiding Norfolk. Clay Creations, Jon Gibbs, Toni Cross, Simon Litten, Pebbles and The Hare & The Hen have captured the beauty of the local countryside and wildlife with photography, art and sculpture. If you fancy staying in this beautiful part of the world, then Retro Campers Norfolk can supply you with a VW campervan. You could drive it to the campsite at Deepdale Backpackers & Camping or hire one of their tipis, yurts, shepherds huts or stay in their backpackers hostel. The Caravan Accessory Shop will help you get kitted out for your adventure. 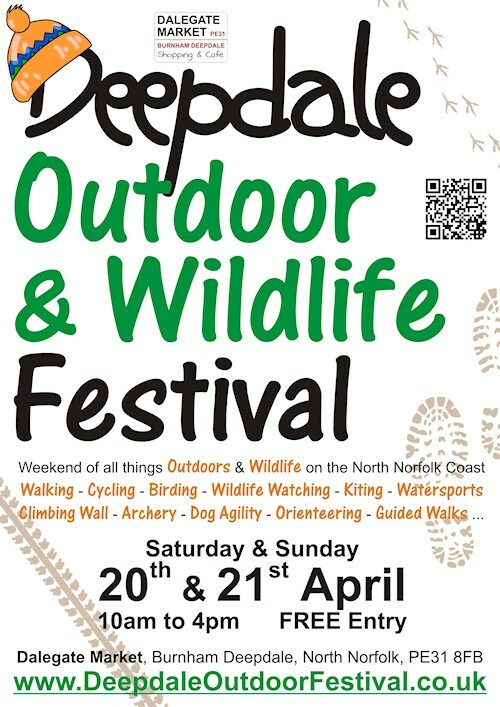 The Deepdale Outdoor & Wildlife Festival is an Earthday 2013 Event, part of the worldwide series of events around the annual Earthday (22nd April) organised to raise awareness and appreciation of the Earth's natural environment.